Historic zone of Basseterre is part of the Tentative list of Saint Kitts and Nevis in order to qualify for inclusion in the World Heritage List. In February 2008, I flew on Winair from St. Maarten to Robert L. Bradshaw International Airport, which is only a short walk to Basseterre. 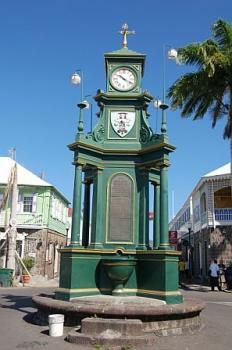 In Basseterre, I visited the Berkeley Memorial, a clock that stands in the centre of the Circus, and Independence Square.